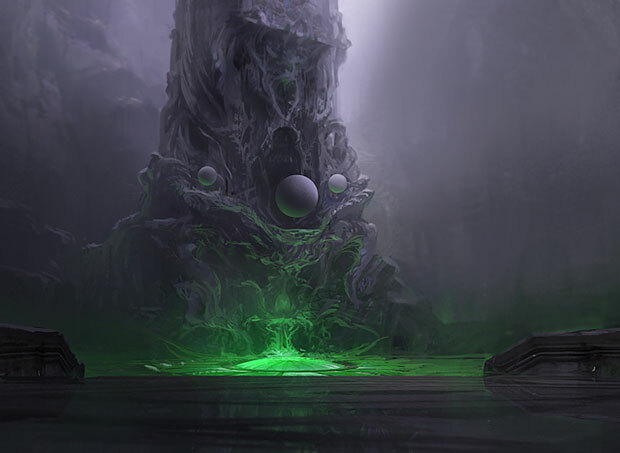 All of Journey Into Nyx has been officially spoiled so l want to identify cards that have received a fair amount of buzz from the set, what the preorder price of those cards are, and what I think will happen in the future once the cards start seeing Standard (or other) play. 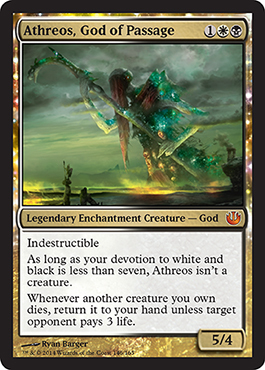 I think that Athreos is the most powerful god in Journey Into Nyx. He will fit well into future B/W/x aggro strategies and will make your opponent think twice before wiping the board. 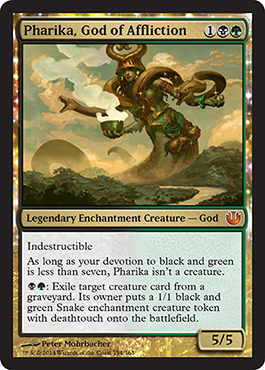 At three mana he is the cheapest of the gods along with Pharika. Is he worth it at the current preorder price of $20? Unfortunately, after much consideration I can’t say that I am comfortable with a $20 buy in and my advice is to wait this one out. I don’t foresee him becoming a format staple like Sphinx’s Revelation across multiple deck archetypes or providing the signficant backbone of several decks like Domri. I am thinking Keranos will see Standard play in U/R/x builds because he gives you incremental advantage every upkeep which is exactly what control decks are looking for. The closest comparison I can think of is when Staff of Nin was in Standard. 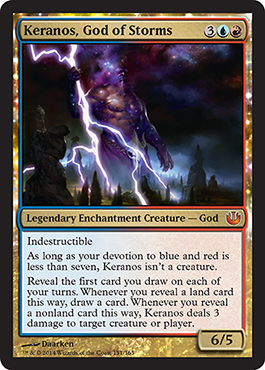 That card saw play as either one or two copies in control decks and I can see Keranos filling that same role especially because his ability interacts so well with scry. You can really take advantage of his ability and have more power over choosing whether you want to deal damage or draw cards if you can scry for two or more (Prognostic Sphinx anyone?). Preorder prices are averaging $13 for this god which I believe is accurately assessing his power level and the amount of play he will see. I don’t think he can go much lower than this so trade for your copies if you know you want to play him. His ability is powerful but I doubt that any player will need more than one or two for their deck as he is rather expensive and doesn’t have an immediate effect on the board. He doesn’t have much room to drop and growth could be substantial if he is adopted across several archetypes. Foils of this will be sought after. Iroas really excited me the first time I saw him. 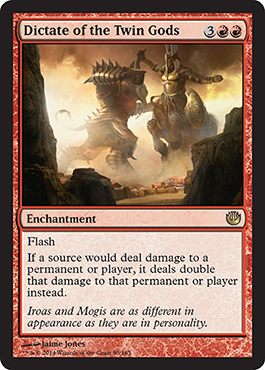 It’s basically a combination of Gruul War Chant and Dolmen Gate that is indestructible!? Sign me up. This guy is going to be awesome in R/W aggro builds that want to take advantage of his ability. The only downside is he is really just a win-more card. He can’t help you against control decks but can be insane as a finisher card in an aggro deck. At the current average of $14 I would wait a bit to purchase him even though his abilities are really powerful. 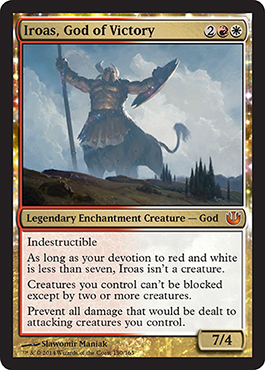 I would be looking to pick him up over the summer in anticipation of seeing him in Theros-heavy aggro decks during Standard rotation at the end of the year. Until then I don’t think his $14 price tag is worth the preorder price. At first I wasn’t very impressed with this god. 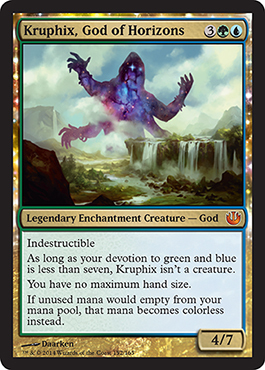 I was expecting something a bit more overtly powerful but I reassessed the card and realized that Kruphix is a deceptively powerful god. 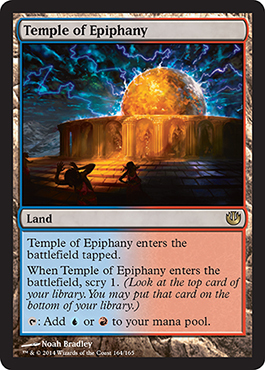 Being able to float any of your mana, whether from lands or mana rocks, is a crazy powerful ability in Commander. Also having no maximum hand size is great for casual formats since blue based decks generally draw lots of cards and can’t use them fast enough. 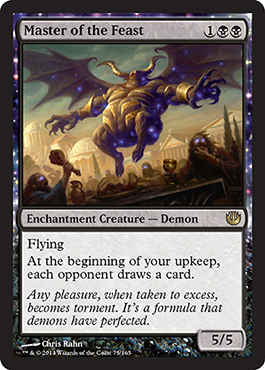 I would expect foils of this to command a premium. Kruphix is preordering for $9.50 which is close to it’s real price but I think there is still room to drop. In Standard he just doesn’t offer enough to command a price near $10. I think that $6-$7 is where Kruphix will end up and that you want to be on the lookout for copies once it starts dipping down in price. I had such high hopes for the B/G god that cost only three mana but we only got a card that is marginally worse than Scavenging Ooze which sees play in only about 12% of decks. Making deathtouch snakes is a pretty cool effect for casuals and Commander but Standard will not drive its price very far at least for now. Stay away and wait for her to drop into Karametra range before picking up. I like the dictates for what they offer in casual and multiplayer formats but I don’t see them making a big splash in Standard, except for maybe Dictate of Heliod as one or two copies in an aggro deck. I’ve noticed a lot of sellers offering Dictate of Heliod at around $0.35 to $0.50 preorder – this is really low for a potentially game breaking effect. Certainly trade for these if you feel that you will be playing a white based aggro deck in Standard. 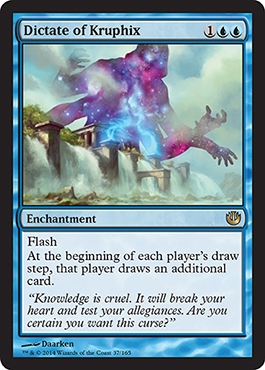 Mana Confluence is a powerful land that will have an impact on Standard throughout its life. No more does the two color aggro strategy need to hope for the perfect draw of colored lands or tapped fixing in order to play out their hand – City of Brass 2.0 comes into play untapped and lets you execute whatever plan you need based on the cards in your hand. There has been a lot of controversy surrounding Mana Confluence’s price. Some think that it will break the $20 barrier and stay there for its entire life in Standard. Some say that it is clearly overhyped to the max and will drop down to a more reasonable $7-$8 while it is in Standard because control decks clearly don’t want to play this and aggro won’t be so keen on having to keep pinging themselves in order to cast their spells. It is currently preordering for $17-$18 without much wiggle room between vendors. 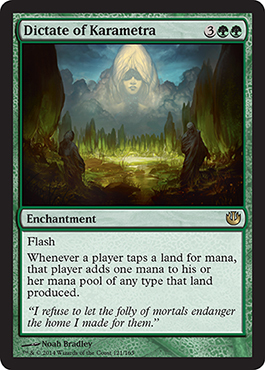 I think a lot of people are going to scramble to pick up this land right away because they feel they will need it in Standard. Due to this mad scramble, I honestly think this land won’t be dropping below $15 for the entire time is in Standard. If you need them, they will only go up as we approach the fall rotation because mana fixing is going to be even harder once shock lands rotate out of Standard. As for the new scry lands, I would pick them up if you need them but otherwise stay away until the summer. The U/R scry land in particular will be be a good pickup for the future because I foresee Keranos getting some play if not in this Standard season then definitely next year. First Green and White Planeswalker! Though in my opinion the laziest ultimate of any Planeswalker, I still think the first two abilities are solid since they are both +1 effects that enable G/W decks to accomplish amazing feats. Pumping up your creatures permanently or searching your deck for auras, creatures, or planeswalkers are powerful effects. 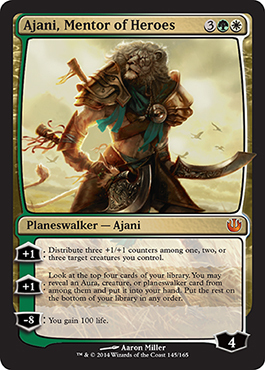 At five mana this version of Ajani is pretty pricey but since he is in green I could see him coming out a turn earlier quite often. Starting at four loyalty is a nice bonus as well. Ajani is currently pre selling for around $24, which is very surprising as I think he is much better than Kiora which is still around $20. Still though, at $24 is he worth it? I would say – not yet. There isn’t an established G/W deck that is currently rocking Standard, so if you do buy in at $24 and the deck doesn’t appear until next year you are sitting on Ajani for quite a while when instead you could be picking up unrealized Modern potential. Also at five mana I can’t see him being played that much, but again I was wrong about Elspeth, Sun’s Champion so this could indeed see a lot of play inside a Junk or Naya shell. At least he will retain the appeal of being the first G/W planeswalker. This equipment is pretty crazy, don’t get me wrong, but I don’t think we’re quite on the level of Batterskull here. 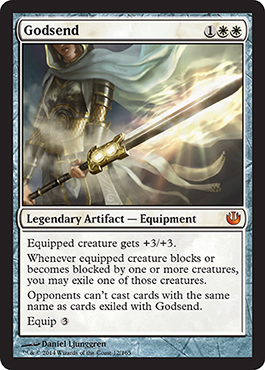 I see this card being very powerful in Legacy where True-Name Nemesis is all over the place and this equipment makes their TNN unable to successfully block any of your guys. It also prevents them from casting future TNN’s if they do decide to block. Unfortunately, this equipment does not offer any type of “real” protection (as in, protection from a color, hexproof, etc.) nor does it have an immediate impact on the board state once it hits the battlefield. It also is restricted to white, so again unlike Batterskull the applications are more limited in formats like Legacy and Modern. In terms of Standard, I can see it making an impact in white based aggro strategies but right now those strategies are suppressed by more dominating decks. I would wait until summer to get this equipment as I don’t think its current average of $13 is worth buying in. Once more aggro decks are present after Return to Ravnica rotates then it will be in higher demand. All of these enchantment creatures, while having unique and somewhat powerful effects, all say “almost” to me. 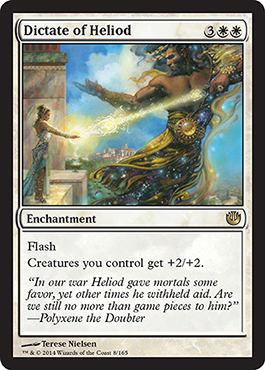 While Eidolon of the Great Revel seems like it would be good in Legacy, its older brother Pyrostatic Pillar sees almost no play currently. Storm decks have been nerfed over the past decade by more powerful creatures as the game starts to stabilize itself as a creature based rather than spell based game. 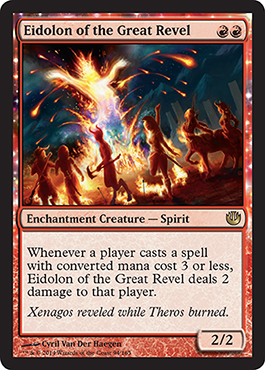 While Eidolon of the Great Revel is a step in the right direction I don’t think it will make a significant impact on eternal formats outside of being played in Legacy Burn. For Standard, I don’t think it will be played much either because you really want this in a control deck but control decks aren’t casting early creatures just to wipe them out later. 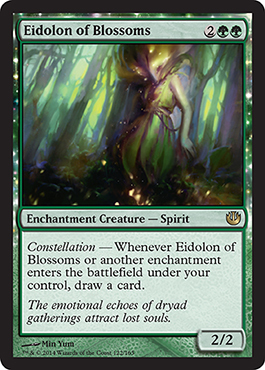 Eidolon of Blossoms has a sweet Constellation mechanic, probably the most powerful in a bottle from Journey, but being printed as the buy-a-box promo does stabilize the value significantly. In addition, its sisters Enchantress’s Presence and Argothian Enchantress are strictly better in the the Legacy Enchantments deck. Verduran Enchantress has existed for a long time and has never seen Legacy play so I don’t think this one will either. Whether or not it is played in Standard remains to be seen but I think if it goes below $0.50 you may want to pay attention to it. Master of the Feast is a bigger body than Herald of Torment, but I think that the card advantage this offers your opponent is too much over the course of the game. I don’t think this will enable it to see top table Standard or other format play. 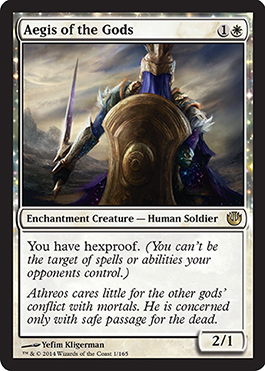 Aegis of the Gods grants you hexproof, which is nice, but like True Believer and cards that have come before it this is a sideboard ability at best. It is a Soldier, which puts it in a better creature type, but most of the time this guy won’t be any better than Goblin Piker until the right matchup comes along. Deicide is a great removal option for the plethora of gods that Standard will eventually see. 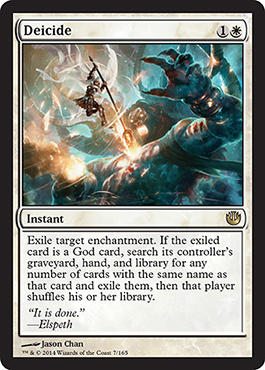 A cross between Erase and Memoricide/Cranial Extraction for gods, I have a feeling that this will see a lot of sideboard play in Standard. 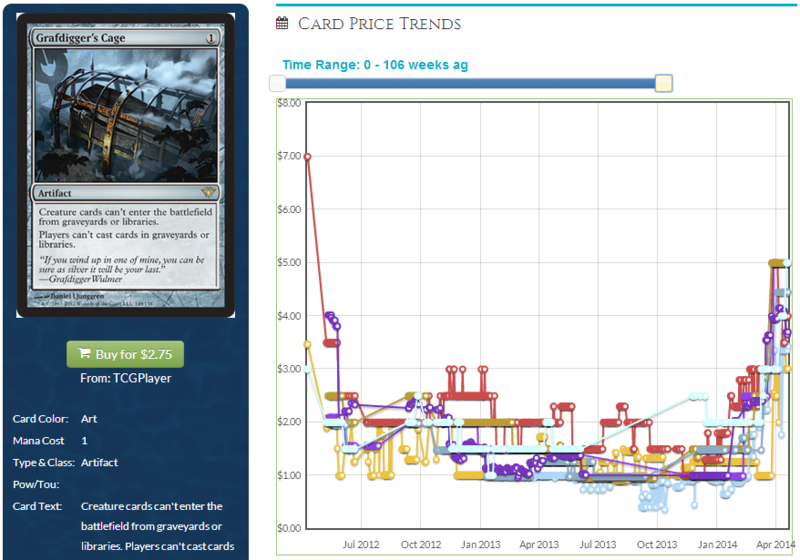 However I do not think that being a sideboard card warrants it to maintain a price above $3. It is currently preselling for about $3.20 so I would wait a bit for this one to drop in price. Sideboard cards usually wind up in the $1-$2 range before going back up if they are really important against a particular strategy. Trade for them when they get close to a $1 because I feel they will see plenty of Standard play. See Grafdigger’s Cage as a prime example. It only recently started trending upwards in price. During its time in Standard it was around $1. 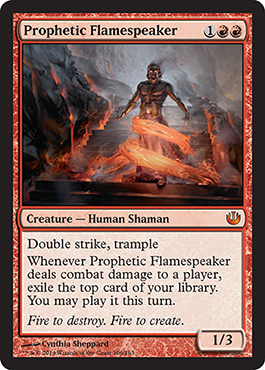 Prophetic Flamespeaker is quite interesting. It has double strike and trample, a combination never seen before on a card. It also allows you to cast spells whenever it hits a player and even potentially play a land and cast a spell. At first I thought the spells were free, and if so then I would be all over this guy. Alas, the spells are not free. Yes if you hit your land drops accordingly and the spell is on curve you could play it but you otherwise need to have enough mana to cast those spells. Being a 1/3 for three is also pretty marginal without any kind of evasion. 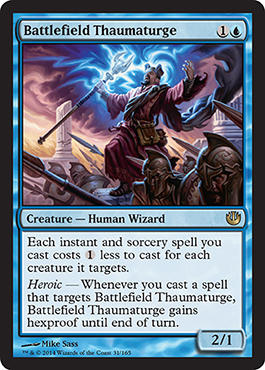 You really need something like Madcap Skills to make this work, which I think is starting to ask for a lot when trying to build a strategy around him in addition to not playing your lands or saving mana for spells he will reveal. Wait this one out. I have a feeling he will either stay at his $8 price due to untapped potential or coming further down in price if he sees no play. Battlefield Thaumaturge is pretty amazing with Fireball and its cousins like Comet Storm. This makes it awesome casually but is this ability enough for it to see Standard play? It makes your removal cost one less when targeting your opponents creatures which is cool. However, Standard removal is already pretty efficient for the colors it needs to be so I don’t really see this mattering much in Standard. Giving itself hexproof until end of turn is nice but I don’t think it really makes it that amazing when you have to cast a card to make that happen. He is currently preselling for $3 which I think is too high. I would wait for this one to drop a bit more before picking up. Journey Into Nyx shares one similar characteristic to Born of the Gods which is that I’m not advocating that you preorder anything from the set, at least from a Standard perspective. This isn’t that surprising though because 99% of the time preordering cards for profit won’t work. Casually the set is filled with all stars and the casual cards have a significantly higher power level than Born of the Gods. If you are looking to pick up cards for casual purposes there are plenty of fairly priced preorders for this because in the far future many of the cards will still hold casual appeal and the price should reflect that. You want to keep an eye on Temple of Malady and Temple of Epiphany as well in the summer so that you can pick them up on the cheap. Then trade them later when Return to Ravnica rotates out of Standard. Dragon Tyrant would like a word with you. Nice catch, haven’t seen that guy in a while. As a casual/Commander player, let me echo your sentiment about mana confluence being hype. From the casual/Commander standpoint, I don’t see much difference between this & City of Brass… which I already have multiple copies of, and exists in many different printings for MUCH cheaper. Sell this one quickly, in my opinion. It will not retain any of its value once the current block expires, and will fall to the $3-$3.50 range that most printings of City of Brass are currently living in. You are SO WRONG about the price of mana confluence. The price after rotation will never be the same as City of Brass. Why? City of Brass has almost 10 reprinted version so that there are plenty of supply in the market. 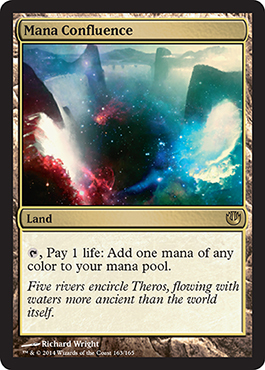 People will need one of mana confluence in their multi color commander deck. Demand will be much much more than Supply IMHO. The price might not stay at $20 like it is now but certainly not around $3 as you mentioned. Valid point about card limit. I still don’t see this card above $4-5 once the block is gone. I say make your profit on this card now. I think Eidolon of Blossoms and Keranos are underestimated right now… especially Eidolon of Blossoms. Eidolon of Blossoms is not strictly worse than Enchantress’s Presence and Argothian Enchantress. The ETB effect does make card advantage and that is a huge benefit that you can’t ignore. I think we might even see it in T2 decks and the current price is probably near its floor. Buy a Box promo doesn’t always mean that card needs to be below $5. Look at Nightveilspecter or Sylvan Caryatid as a good example.